Recently I announced that my English site ExcelKB will change its focus and therefore all my Excel related articles would be dropped. Soon after the announcement I was approached by an employee at Microsoft asking if I would be interested to have the articles published at MSDN. Actually, I accepted it immediately although it means limited rights to the material. I have no idea when anything will be published but I’m pleased with the fact that the material will be published. I also admit that I feel proud that my articles qualify to be published at MSDN. 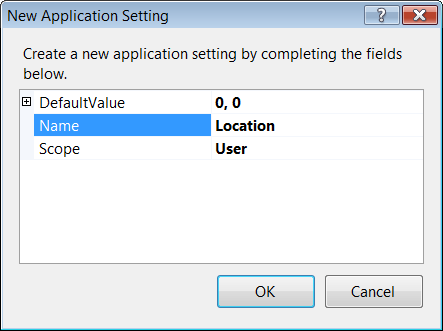 As already pointed out by Mike Rosenblum; if we use C# then we need to save the settings for the Windows Form also in standalone applications. 'Of course, each variable can be set on its own. That’s all for now and in an upcoming post I will discuss anchoring and docking controls on Windows Forms. 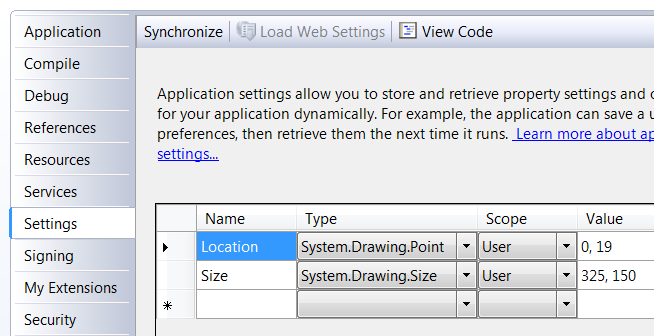 Misha Schneerson has now made the Shim Wizard for VS 2010 available for download. What should be noted is that the new version is not officially released by Microsoft and it’s not officially supported. For more information please see COM Shim Wizards for VS 2010. In view of the fact that VSTO is getting better and better for every new release the need to use managed COM add-ins will decrease. Especially if we only develop for one software within the Office suite. Perhaps this new version of the Shim Wizard will be the last one? 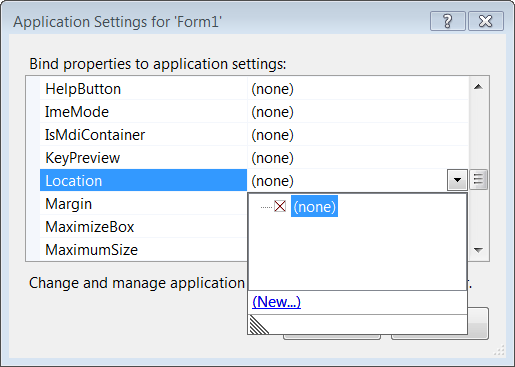 To preserve size and location of Windows Forms are in many ways a common service towards the end users. In this first part I will take a closer look into how we can remember theses settings between the sessions for standalone applications in VB.NET. In part two and last article I will discuss it for managed COM add-ins and VSTO add-ins. Name the new Application setting to Location and then click on the OK button. That’s it! To set up the size setting we repeat the above steps but instead of selecting the property Location we select the ClientSize and name it to Size. 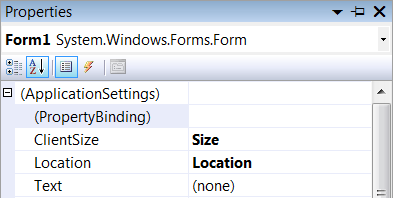 So whenever the end users change the Windows Form’s location and size the above solution will automatically preserve these two properties. In view of the above we can conclude that is quite easy to keep track when size and location are being changed for any Windows Form. The VSTO development team recently announced that they has released a hotfix for Office 2007 so that we now can deploy VSTO solution to “All Users”. For Office 2010 it has been fixed while for Office 2003 it is left out. For more information please see Deploying your VSTO add-ins to All Users. To get the hotfix for Office 2007 please see A 2007 Office system application does not load an add-in that is developed by using VSTO and Description of the 2007 Office system hotfix package (Mso-x-none.msp): October 27, 2009. This is the second blog post about populating a TreeView control. In the first blog post, Populate TreeView Control with Tables and Columns from MS Access Database, I used a MS Access database to populate a TreeView with its tables and related columns. In this blog post I will instead be using a SQL Server Database. 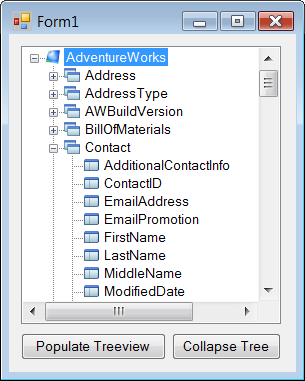 The first example is based on a SQL query and where the retrieved data is than used to populate a TreeView control. Since it very common that users don’t have access to system data like system tables I also show a scenario where the required information is made available in a XML file. In the second example I use the XMLDataDocument Class to read the XML file in order to populate the TreeView control with required data. 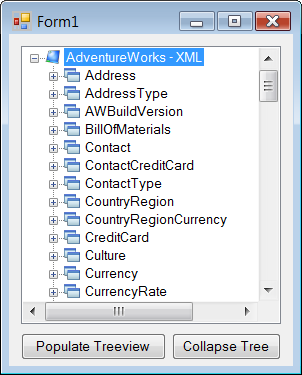 Const Database As String = "AdventureWorks"
Const Database As String = "AdventureWorks - XML"
'Open and read the document. 'Node that includes the wanted childnodes. That’s all for now and the next blog post will show how we achieve the same tasks as above by using LINQ to SQL and LINQ to XML.